See Nepal treks and India treks for current treks. + means summitted the mountain. In addition to our treks and climbs, Jamie is a photographer and conservationist and here we showcase our other projects of the year. Jamie wrote the book - literally! During 2016 Jamie trekked the whole Everest region, from Bhandar to Lukla and from Tumlingtar to Lukla, the "Everest Three Passes", and climbed Mera Peak, and more, to update this guidebook. With a 2016-new trekking trail, suddenly the Makalu Base Camp trek becomes far more appealing, no more there and back along the same route and less risk of getting trapped. We follow the Makalu expeditions to base camp, rub noses with the fifth highest mountain on the planet, then trek out along the new Barun Khola trail to the mighty Arun River and some cultural village trekking to finish. Sadly, this was Paul's last Himalayan trek. At around 75 years old, his balance is deteriorating. It has been quite a run - or trek - I should say, with at least six of our 42 day exploratory treks under his boots. Bill was a true friend, with them sticking together for a quick exit. Jeff and Bali continued up to Makalu BC and talked with the locals about the new exit route constructed by the Nepal Mountaineering Association. That is the theory, in practice there is barely a trail and no promised campsites. Don't take this trail. The best middle hills to alpine trek there is, and of course with a few extras we make it better. Which is the best trek in Nepal? 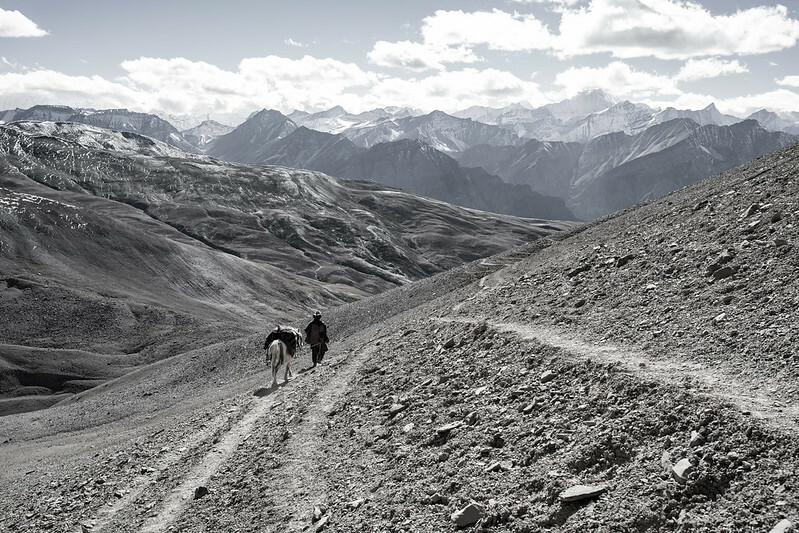 This journey across Upper Dolpo to Mustang, probably! Explore the secrets of Nepal's Shangri-la, through the culturally Tibetan villages and sacred monasteries, along meandering alpine valleys and over breathless mountain passes, and all a visual feast of gorgeous, never-ending trans-Himalayan panoramas. Best for private groups of six or more. What a star trek crew, everybody agreed, and what an area... And the Kiwis proved to be tough trekkers too. They are planning more adventures in the future. Powerful beauty. Which is the best trek in Nepal? Our sublime Upper Dolpo trek to Mustang probably! We explore the secrets of Nepal's Shangri-la, trekking where few dare, through the culturally Tibetan villages and sacred monasteries, along meandering alpine valleys and over breathless mountain passes, and all a visual feast of gorgeous, never-ending trans-Himalayan panoramas. Well, so much for the monsoon ending in late September, it lingered for almost two weeks longer; at least our domestic flights (and the Upper Dolpo to Mustang team above) dodged the clouds and were on time. The dampness with occasional night rain provided "Chinese landscapes", Paul mentioned,and the moodiness was beautifully picturesque. Once the skies finally cleared, it remained fine and somewhat windy for the entire rest of the trek, not a cloud in the sky, and day after day and the Dolpo landscapes shined with that clarity of light. The sublime panoramas, last century self-sufficent villages with their tough but smiling inhabitants and the wonderful camping spots still make this one of the very best treks in Nepal. It was also a trip of less usual medical issues, and thanks in particular to Fran and Esther for wound dressing and care for the members, and Mingma for the crew. Sadly Alan suffered some medical complications that we were not able to diagnose in the field and had to be evacuated, and Denise's list of issues just seemed to grow longer despite following good treatment practice. It was a shame to see them heli-evac'ed out, especially as they both desperately wanted to stay and continue, Denise's facination with Bon was an inspiration and education for us. There were also a surprising number of scrapes and bruises, and thank goodness the huge Tibetan mastiff only took a nip at Phil, rather than a chunk (perhaps the less than youthful leg was a bit tough?!) and a horse bite wasn't perhaps undeserved either, they were loaded up, working double time in the beginning. Yep, Dolpo logistics are challenging. The exploration was a total success, we crossed and recrossed the ~5700m Mu La, to staggering views of Dhaulagiri II and other peaks and can confirm that the pass is marked wrongly on most maps (as is the pass out of Bhijer) and that the Mukot/Mukut locals can indeed take their children by horse over the pass, although that says more about the stocky, longhaired Tibetan ponies than the gentleness of trail. In fact we crossed no less than 8x 5000m passes on this trek, a great effort by the porters. And no trip is complete without thanking the hard-working kitchen crew and sherpas, who handled dividing the gear and crew between the longer and shorter versions of the trip with aplomb. Thank you everyone! Our Ladakh treks and Zanskar treks (in olive) and trek-climbs (teal-turquoise) are still absolutely unique adventures run by the most experienced guides with the best trek crews in the land. All treks lead by Jamie filled, this season (indeed this year). Plan and book early for next year! The Markha Valley is a classic trek yet homestay trekkers have to skip the highlights. We know and love the area so explore and scramble to over 6000m (! ), in the domain of blue sheep and wolves, which we have seen on every trip, and the more elusive snow leopard. We end with a dramatic pass which drops us into a sublime valley with sparkling streams for a refreshing wilderness end. Success on Dzo Jongo, with everyone except Ranjan who was struck by an intestinal virus at exactly the wrong time. And blue sheep galore! The Markha Valley once again proved to be a great introduction to trekking in Ladakh and to altitude, and showed that we are on track with the peak, and that our remote exit from the region really is a wilderness delight, with wildlife everywhere. We will be back, and indeed so will everyone who trekked with us. This was a great trip, except that I could not make it up Dzo Jongo but there is always next year for that. It was really fun and awesome company. I just wanted to thank you all for a wonderful, wonderful trek. Your company was just a delight and I am so grateful to you all. Combined with the wonderful trek above as a warm up, we continue into ever more remote and dramatic areas, crossing a gloriously scenic old resupply pass and exploring its secrets, only partially revealed last year. We then pick up the high Rumtse to Tso Kar (salt lake) trail, with more trademark exploratory days in this big sky country, completing our comprehensive Markha to Changtang route. We found and crossed that old supply pass with glorious views and after seeing the beauty of the other side, hung around by the bluest of lakes rather than moving on too quickly, and found plenty of "viewpoints". Yes, our exploratory treks are still exploring, really, truly exploring. The area is an absolute delight with wolves, foxes, many kiang and snorting yaks, and those grassy valleys and plains. And mountains and more glorious mountains. We will return! The second extension turned into Rumtse to Pang, with some wildlife and exploring. The first section (Rumtse to Tso Kar), while a good trek, shows why we trek remote and wild instead, with busy camps and lots of visual rubbish. At Tso Kar we photographed the bird life and wildlife, then explored the little-used Barma La to the Pang area. We have now crossed all four of the main passes across the Mentok range, but have yet to make the mistake of crossing the false Lanyar La, ie the wrong trail marked on the Olizane map. We are probably the only team that knows all these four passes, and what they are best for. Across Zanskar has always been the classic trek; we avoid the new roads with two adventurous variations that few dare for mesmerizing views, adventurous canyons, stunning wild camping and pretty villages. Rugged, colourful rock contrasts with the azure rivers and green village oases. Monasteries cling to rock faces and Buddhist chortens dot the immense landscape. It is the updated classic and one of the very best treks there is. Stunning! Every time I trek Zanskar, I am blown away by the variety. Every single trekking day has different landscape features, and our itinerary is particularly adventurous, and good. For me, this was a goodbye to the Shingo La as I (and many other trekkers) know it, as the under construction road now reaches the top of the pass, although with no real traffic as yet. Surprisingly it was still pleasant trekking and luckily the camp sites are still undisturbed, and the view from the top still glorious but the bulldozers are pushing. Our Gumburanjon camp was still an untouched delight, as indeed was Kargkak where we had tea with Stanzin Kungha's family, our delightful, polite kitchen hand. The road is due to reach the village Oct 2016 though (and perhaps I should have taken more photos of the pristine valley, in hindsight). Leaving the main valley, the crossing of the temporary bridge at Phuktal was a real adventure, and with the bridge made partly of woven willow branches, harks back to the bridges of yore. The crew shouldered the loads while the horses swam across, thank goodness without incident in the big Tsarap Chu. From this point I was worried about the trail condition after the natural dam burst-flood a few years ago, however all was back to the normal. Shade, the remotest of villages here, again delighted, reinforcing that our route really is the best. From there we followed snow leopard prints, met some prancing, rock-climbing young ibex who were just as curious about us as we were with them, and the passes and canyons provided that real adventure. After touching the huge main Zanskar valley, the adventure continued with our Honya or Bear Valley alternative. Ram Lal and Lobsang and the team really dug in deep to make a trail in one section for the horses, and when the second mule across took what could have been a serious fall, everyone's heart was in their mouth but a smart recovery with the assistance of the ever-vigilant Ram Lal averted disaster. Arriving in Yelchung, with its new jeep access, the homestays are sprouting, and perhaps finally the locals are starting to get the tourism business such a picturesque and friendly village deserves. With the roads that are pushing ever further, Zanskar is set to change rapidly in a few years and I will publish an article on this soon. A big thanks to everyone who joined, and the crew. Phil's joke of the day was a real delight, and John's occasional less than PC limericks also didn't always elicit groans. Thanks for a great trip to a fantastic location and in wonderful company. The organisation of the trip was very smooth and made for a most enjoyable time in these very remote wilderness areas. Thanks again for keeping us all together during the tough climbing days and for everything else during our fantastic trek in the Zanskar area. Jamie, it’s not until we arrived home and reflected on our month in Ladakh that we realised what a unique experience it was. We have you to thank for a wonderful trip and are grateful for your passion and expertise. Thanks so very much. We hope to travel with you and your crew again one day and will keep our eyes on Project Himalaya. We will also continue to rave to friends and family about your trekking tours and to anyone else who will listen. I am sure that I have mentioned in a previous message that I will fondly remember the Zanskar trip for the rest of my life and sure that I would equally enjoy another trip with you to Nepal if the chance comes up and while I am still fit enough to complete these gruelling treks. Jamie spent seven weeks trekking in the Everest region, and climbed Mera Peak as part of updating the guidebook Trekking in the Everest Region by Trailblazer Publications. I met loads of friends and had a great time, however didn't lead a group in that period. I also took some awesome timelapses which I am really looking forward to processing.